SRI LANKAN BEETROOT CURRY(VEGETARIAN, VEGAN). 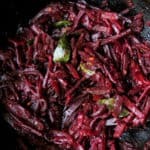 SRI LANKAN BEETROOT CURRY, WITH A VARIETY OF HEALTH BENEFITS, THIS COLORFUL DISH IS A MUST TRY FOR ANYONE WHO’S BEEN EATING THEIR BEETS IN SALADS. VEGAN, VEGETARIAN, GLUTEN-FREE, LOW-CARB. Place a cooking pan over low heat and add the beetroot slices to the pan, followed by curry leaves, garlic, onions, turmeric, chilli and salt. Once the water evaporates, you can add coconut milk if you are looking for a more creamy dish but for this recipe, I’ll be adding oil to make more of a sautéed version. Pour in the oil, reduce heat to low and cook the beetroot until take on a more semi-fried look, 10 minutes. Season with salt and chilli if necessary and serve warm.